The letters CRC after a credit professional's name speak volumes. Take control of your career with the only recognized professional designation for credit and lending professionals. What will the CRC designation say about you? Why should I be Credit Risk Certified? In today's rapidly changing financial services industry, credit and lending professionals will continue to play a critical role in shaping the risk profile of their respective institutions. The CRC is the only recognized professional designation for credit and lending professionals, and earning it gives you added credibility among colleagues and clients alike. 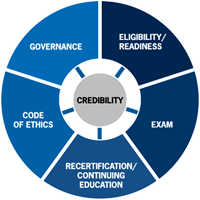 As a credentialed risk professional through RMA, you demonstrate a commitment to the credit risk industry and a level of industry knowledge that has been recognized by an objective, outside organization. Becoming a CRC holder establishes you as a member of a respected group of CRC credential holders and provides your employer with an objective measurement of your capabilities. Passing the CRC exam is an indicator that a CRC holder possesses the knowledge and skills necessary to master a myriad of credit risk situations. The CRC provides you with a platform to network with some of the world's leading credit risk management professionals, expanding your professional knowledge and opportunities. Earning the CRC is a step in your own personal career growth and gives you added confidence in your skills as you pursue your short- and long-term career goals. Is RMA Credit Risk Certification for you? Mastering the content of the CRC exam represents a commitment to the credit risk profession, and to your career overall, positioning you as a leader in the field. Attaining the CRC provides the feeling of personal achievement and the satisfaction of conquering a rigorous exam developed by the best credit risk practitioners. What Makes The CRC a Recognized Benchmark Designation? The CRC program measures your grasp of fundamental concepts, the application of those concepts, and the best thinking on the subject. To become a CRC holder, you must pass an intense multiple-choice exam and must demonstrate several years of professional work experience in the credit and lending field. Earning the right to use the CRC designation after your name demonstrates knowledge, professionalism, and dedication to the profession. Our Credit Risk Department was, basically, a decent department, but the managers we brought in believed that it could be an excellent department. One of the ways we achieved that excellence was through the CRC. We all took and passed the CRC, and the next time the OCC came to look at us, they considered us a very strong credit risk review department (from the control function perspective). I decided to get my CRC so that everything I had learned and everything I had experienced up to that point in credit risk was recognized and acknowledged. I believe it’s important for my credibility and I wanted my bank’s management to know that when I had something to say, there was substance behind it—that’s what Credit Risk Certification gave me. I think someone in the credit side of banking should pursue a CRC. It validates your knowledge and experience in the industry. I don’t think you can just study and expect to pass the test for the CRC. In order to pass, you also need to call upon your experiences in the industry. Being Credit Risk Certified has helped me with one of my primary job responsibilities—interactions with the regulators. I believe that my CRC designation has given them confidence in my abilities as far as grading the loan portfolio, properly classifying loans, and also preparing the allowance for loan loss. A very important piece of advice I can give to any candidate going for the CRC is to gain the experience. Five years of experience is absolutely crucial. You can read the book and know the material left, right, and center, but if you don’t have the practical experience, you won’t be able to make it through that exam. One other note: the CRC exam will really get your brain working. It is a thinking person’s test, not just an A, B, C, or D test.